In this article I am trying to demonstrate the usage of Builder Pattern using a Computer Assembling Robot. Builder Pattern is one among the 23 patterns by Gang Of Four. In a computer manufacturing unit, depending on the configuration â€“ they have to create computers. The challenge is that the computer parts are chosen in the runtime. The order can contain n number of computers based on the same configuration. This could be the right example to implement the Builder pattern where each robot will be setup with a particular computer configuration. The robot will continue creating the same configuration based computer n times. The Windows Form UI allows the user to choose the configuration. The virtual factory provides up to 3 robots to be added before the actual assembling takes place. Following is the screen shot of the main class named Robot. The class contains a property called Peripherals which can be used to configure the peripherals added: like CPU as Intel, Monitor as Samsung etc. After adding the peripherals, we can call the Create() method. It will iterate through the Peripherals dictionary and calls the appropriate methods to integrate the peripherals. This allows us to choose the peripherals at run time as well as the sequence too. If the Peripheral dictionary contains CPU then the AssembleCPU() method is invoked. If the Peripheral dictionary contains Monitor then the AssembleMonitor () method is invoked. 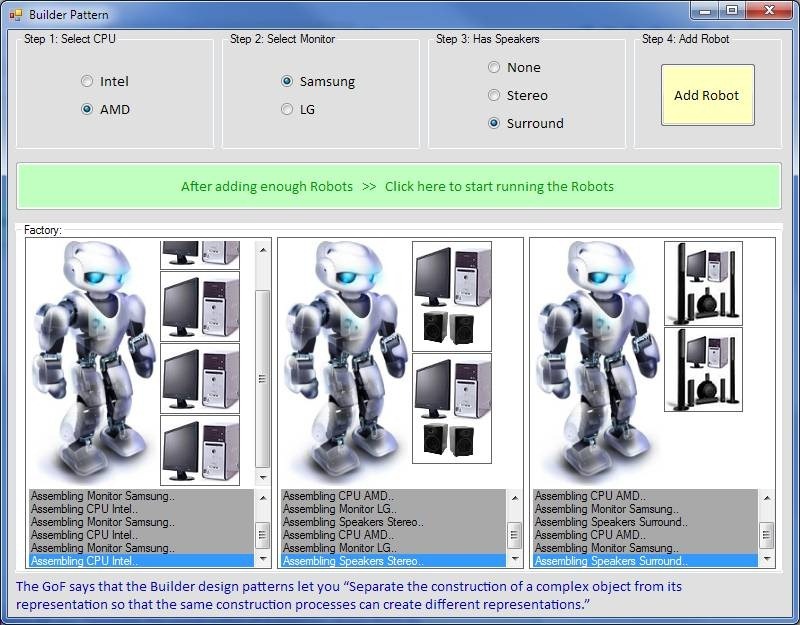 In this article I am trying to demonstrate the usage of Builder Patter using a Computer Assembling Robot. Builder Pattern is one among the 23 patters by Gang Of Four. In a computer manufacturing unit, depending on the configuration – they have to create computers. The challenge is that the computer parts are chosen in the runtime. The order can contain n number of computers based on the same configuration. This could be the right example to implement the Builder pattern where each robot will be setup with a particular computer configuration. The robot will continue creating the same configuration based computer n times. The Windows Form UI allows the user to choose the configuration. The virtual factory provides upto 3 robots to be added before the actual assembling takes place.